Remember the Raspberry Chocolate Cookie Bars I made a couple weeks ago? That were absolutely delicious? Well you can refresh your memory here if not. 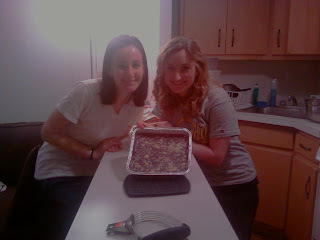 Anyway, I was such a big fan of them, that when my friends Ariel and Alana came over wanting to bake something together, I thought I would try and use the cookie dough recipe from them to make a different bar - this one filled with a chocolate ganache. For those of you who don't know, ganache is a basic mix of chocolate and cream, that can be used as a filling, icing, spread - the opportunities are limitless. I wish I could tell you the amounts I used here - but I basically made it up. 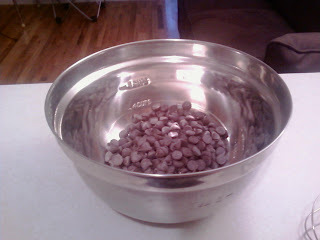 I started with a 12 ounce bag of chocolate chips, and poured about 2/3 of it into a metal bowl. Ta da! Then, I heated up (maybe?) 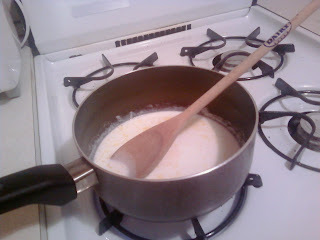 a pint of heavy cream in a saucepan and brought it just to a boil. Then, I poured the hot cream over the chocolate chips and mixed thoroughly. Ganache! I stuck it in the fridge to firm up a little, and went about making the cookie dough base. Once it was mixed, Alana helped me pat it into the bottom of a pan - reserving about a cup of it for the topping. 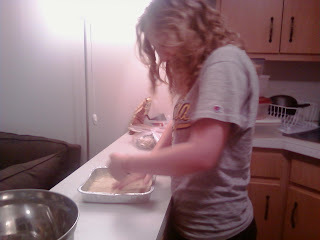 After that, we baked the base for 15 minutes. Once it came out, we poured on about 2/3 of the ganache mixture, topped it with the remaining crumbs, and baked it for another 20 minutes. Chocolate ganache bars, here we come! I know, I know - look away from the glare. That's what comes from having no overhead lighting in your New York apartment and having to rely on lamps. Oh well. 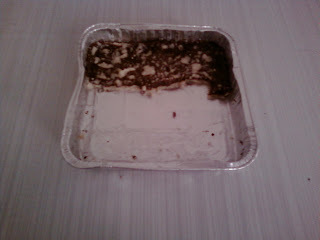 The bars were delicious and everyone enjoyed them - but there was definitely too much ganache to cookie. 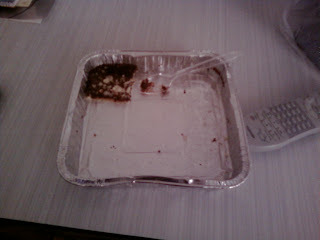 As you can see, the crumb topping sank right into the chocolate and was barely seen. Right after we baked this I was in a rush to leave and so I stuck it in the fridge so the ganache would firm up a little. When I came home that night I took it out and ate a small piece, left it on the table - then later remembered I wanted to take a nice picture for here. ....but somehow I got distracted, and when I came back it looked like this. I suppose that's a testament to its deliciousness. Tip of the Day: When heating on the stove, always use a wooden spoon: they don't conduct heat, and you can leave them in the pot, reducing the need for a spoon rest. Heat cream until just boiling, pour over chocolate and mix well. Whisk together flour, sugar and cinnamon. Cut in butter with a fork until large crumbs are formed. 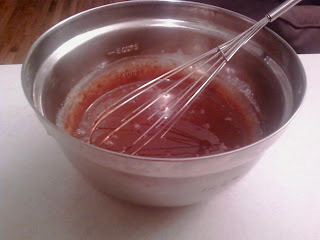 Remove about 1 cup of the mixture and press the rest into the bottom of a greased 9x13" pan. Pour chocolate over base - using your judgement for the amount - and top with remaining crumbs. Bake for an additional 20 minutes. Looks like you saved a piece for me! :) This definitely sounds and looks yummy. Thanks for sharing. If you don't mind I'd love to direct Foodista readers to your blog. Just add your choice of widget to this post and you're all set! sounds great, thanks for the recipe!